For many women, the belly area tends to be the most problematic. The good news is that there are a few ways to help you get a flatter belly, and this has a lot to do with what you eat. Yes, that's right, you can eat your way to a flat tummy, and these are the foods you need. Berries: Berries are filled with fiber, as well as a plant chemical called anthocyanin, which can help burn fat. So start adding red or blue colored fruits like blueberries, raspberries, and strawberries into your diet. Almonds: Raw almonds are a great snack when you're on the move, but they're also a great flat tummy food because they are high in fiber and monounsaturated fat, as well as magnesium, which helps to maintain your body's blood sugar levels. Almonds can also help rebuild muscle and reduce cravings. 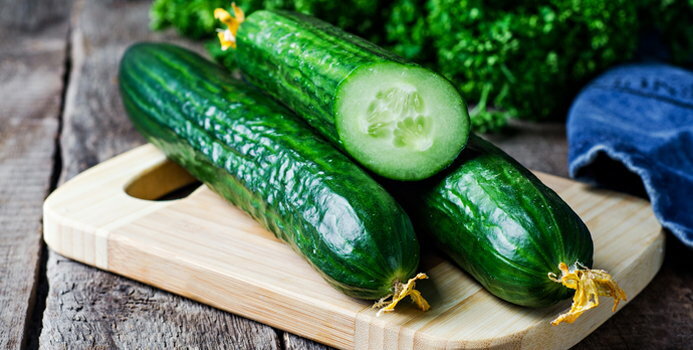 Cucumber: Cucumber has a high water content and is low in calories, but they also contain the flavonoid antioxidant quercetin which can reduce swelling. Bananas: If you're feeling bloated then this could be because your potassium and sodium levels are not in sync (too much sodium causes your tissues to retain fluid), and a great way to fix this is to restore your body's potassium levels—bananas are rich in potassium and therefore help to get rid of the bloat. Yogurt: When we speak about yogurt we don't mean the sugary or false sweetened ones but rather plain yogurt, which is rich in calcium, as well as probiotic bacteria that regulates the digestive system. Apples: Apples are almost 85 percent water, but they're also a great source of fiber which aids digestion and weight loss. Eggs: Eggs are one of the greatest sources of protein and will keep you full, but they also contain vitamin B12 which helps the body to break down fat cells. Avocado: Not only are avocados absolutely delicious (and incredibly versatile), but they are also a source of fiber and packed with monounsaturated fatty acids which help to burn tummy fat. And be sure to avoid refined carbs, sugary foods, and soda, as well as sugar alcohols and sodium.